Ultimate plugin to customize WooCommerce emails. Build your brand, engage customers and improve repeat purchases. Simple to setup, lasting results. We believe emails are an integral part of customer experience. Sending stock emails is disservice to customers. Each email must represent your brand, provide clear content and call to action as needed. Email Customizer for WooCommerce plugin is the ideal solution for all WooCommerce stores. Simple interface, beautiful designs, and no coding whatsoever. Email Customizer for WooCommerce is made for everybody. It is extremely easy to use. And it delivers great results! It’s a must have for everyone who wants to create a stronger brand. Despite all predictions of email being dead, it still rules conversations – and conversions. So if you are not paying attention to email, especially the emails your WooCommerce site sends out, you are in for a lucky discovery here! 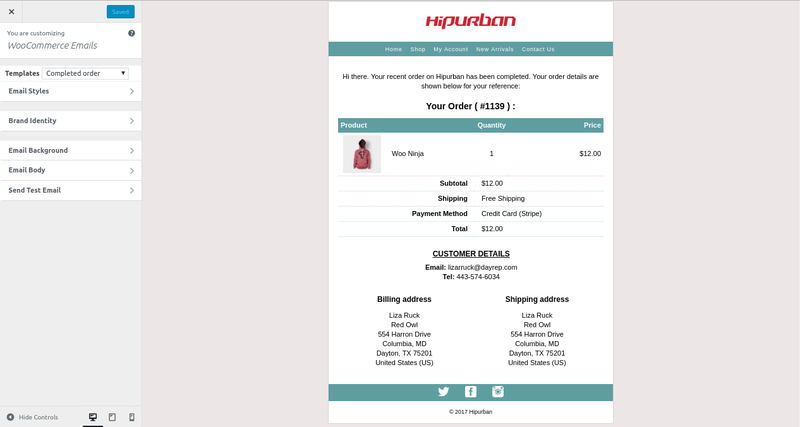 If you look at WooCommerce emails right out of the box, they do their job, but look heavy and repetitive. Even plain and unimpressive. And while you can tweak a thing or two, anyone can look at your email and say – “hey, that’s a WooCommerce email”. Yeah, millions of WooCommerce shops, sending out the same kind of emails. Definitely not a way to build a brand and distinct positioning. Email Customizer for WooCommerce plugin changes that in one switch. It transforms stock WooCommerce emails into unique, unmissable, fully branded emails. When we designed Email Customizer for WooCommerce, our top priority was to create branded emails easily. We know email designs can be messy. So we made sure everyone can customize their emails with Smart Emails. We built Email Customizer for WooCommerce on top of WordPress Customizer – something all of you are familiar with. A point-and-click interface with live preview. Plus we added ready-made designs so you don’t have to start from scratch. Adding your own logo, your brand colors, your social media links,custom message in header/footer, or any custom links – it’s all extremely intuitive. Don’t procrastinate. If you wish that your customers love your emails and remember your brand, invest in Email Customizer for WooCommerce today. Pick a license now! This plugin will only customize the design of your emails and not the text or content of the emails. However, you will be able to translate email texts.